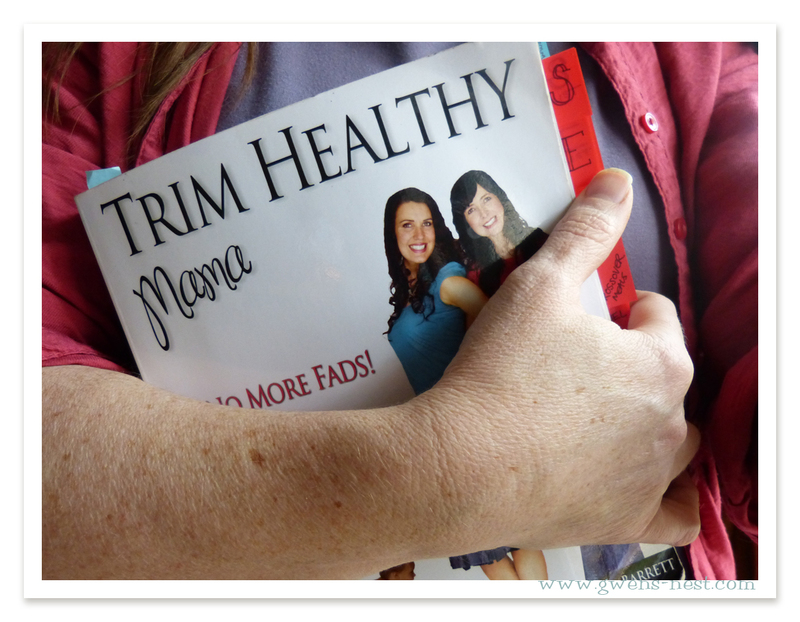 *UPDATED 6/16/15* The Trim Healthy Mama Quick Start Guide that I shared at the bottom of the Book Review was in serious need of an update. And a makeover. 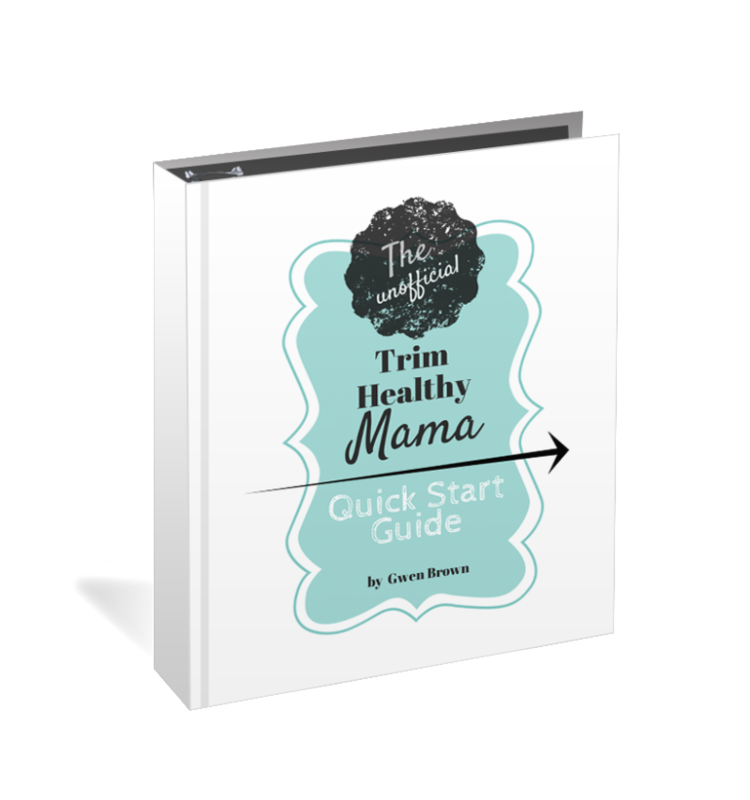 I present to you the all NEW handy printable Trim Healthy Mama Quick Start Guide! 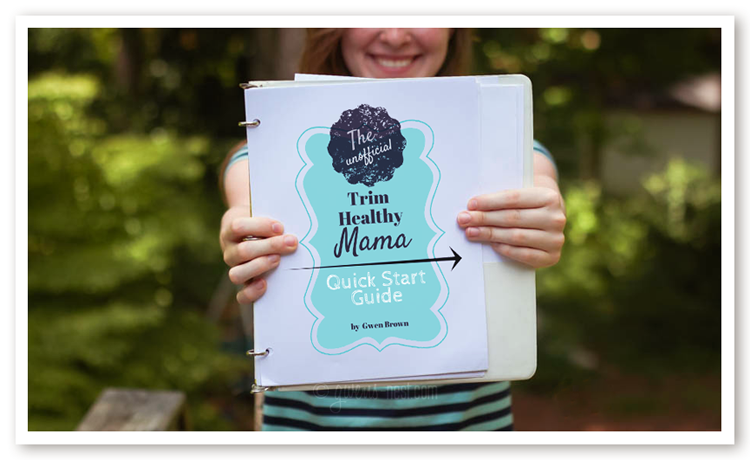 It’s the same short & sweet guide at heart, but now it’s got over 40 pages filled with my best tips, tricks, and recipes for getting rolling on the Trim Healthy Mama plan. It’s my gift to you. If you’ve not had a chance to read about this AMAZING nutrition/recipe/hormone balance/fitness/AWESOME book, then please head here to the THM book review first and take a peek at how I get to eat! What’s Inside the Quick Start Guide? I created the Quick Start Guide to help others get started…here are the tips and tricks that helped me turn my chunky Mama eating habits into a Trim Healthy way of life. a suggested ‘quick start’ plan for tackling the change a little at at time…you’ll be fully on plan in just under a month. and LOTS more! 40 pages of great content and links. THM is not all about specialty foods or expensive shake mixes. Most of the items that I use on THM are found at the grocery store. 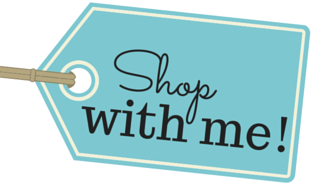 But there are a few favorite brands or awesome deals that are found in online stores only. I was able to add one or two items a month to my stash, and they lasted a long time. You can find great deals and products in the THM Store, or in my Amazon Affiliate Trim Healthy Amazon store. If you’re a visual learner like myself, I’ve included photos of my favorite items and brands to look for in your local stores. Be sure to check out the Trim & Healthy tab in the menu for awesome THM friendly recipes sorted by type and by meal. And I have a few THM Menus that can be found here and here to get you started. Don’t miss THIS awesome board the Latest and Greatest Trim Healthy Mama Recipes, featuring all the best of the THM bloggers! See all of my weight loss updates and photos here. With the help of Trim Healthy Mama…I DID IT! I lost over 40 pounds in around 6 months, and the best part? I enjoy eating this way SO MUCH that keeping it off is very easy! Thanks a million for this and your story! I’ve been on the fence about spending the money on the book (yet another diet book for my shelf of failure) but see hope through the quick start info and your ‘real’ testimony. You look amazing!! Are those fat and carb amounts for the entire meal or per serving on each food item? Thanks for all the info you have posted! That’s for the entire eating period…the whole meal. The numbers are there to help you gauge storebought products, and get a feel for what these meals look like if you’re into numbers. 🙂 Some ladies are. but one cup of cooked broc has 11 carbs. how does that work? I though that was ok on an S.
Gwen, thanks for the great info and especially the “Quick Start Plan”. I am having issues finding the files that you mention to print out in week 1. I have searched and spent too much time looking through the master list, searching and have only found one but I don’t think it is the correct file. It would be so helpful to have a link direct to each article or at the very least the identical name of the file. Gwen, from the bottom of my heart – THANK YOU for posting the THM Start Guide! I was feeling very overwhelmed, eager to start but feeling threatened about all I had to buy and do. Words cannot say how appreciative I am that you took the time to write all this out so that others can benefit from what you learned. I’m so happy to share this…it’s been life changing for me! 🙂 Welcome to THM! Is The Info For Making The Ebook Work For You In This Quick Start Guide? Thank you! I am starting my own blog about this new journey and I am going to link back to this in my first post! What an entertaining presentation of your journey !! May GOD bless you !!! Had a great weekend in TN !!! You two are doing a good work !!! This first week chapter 11 states on day 4 and 5 is Pull the Fuels. That means low fat and low carbs right? Why is the Greek nonfat yogurt accepted as it is quite high in carbs? Greek Yogurt can be used in up to a cup servings if it’s your main source of protein in a meal or snack. It usually comes it at around 9 carbs per cup, and that is below the limit for FP meals. If you’re pairing it with other carb sources or using it with other foods in a meal, then use only up to half a cup. I’m just now getting into these recipes and WOW!!! Thank you Gwen for opening up your journey for the rest of us. I’m all misty thinking I might truly be able to do this thanks to THM and you sharing all your trials. The step-by-step pics are what made me feel able to attempt cooking again. I hated to cook. My kids were eating pop tarts and frozen meals because I couldn’t put a decent meal together. No more! Even my kids are loving the THM goodies (with crossovers for their growing bodies)! Thanks for the quick start guide. It is going to be great help to me. The book will offer some websites to order those items from. Although I haven’t ordered any for myself yet. Hi Gwen. I’ve been on THM for a week and lost 2.5 lbs so far. I still am confused about what goes with what. For instance this morning I had the Cottage Berry porridge whic was great and my third cup of tea with a splas of FF milk. Should I gave eaten something else, or wait until a snack at 10:30 ? The berry whip base recipe is Fuel Pull, so more than likely (unless you used full fat cottage cheese or added a significant fat source [S] OR used more than 1/2 c. blueberries or used peaches [E]) then you’ve had a FP breakfast. I usually *need* to have a fueled breakfast or it just doesn’t stick with me. The only FP I really can get away with is with afternoon or evening snacks. 🙂 For me, THM has worked not by denying the body food and calorie counting, but by fueling it well with the principles from the book (S & E meals). Hi Gwen, I joined the THM FB page, but I can’t find the links to the lists you mentioned. Could you please tell me where they are? Thank you. And your 1 year photo is so cute! It is what is making me begin, along with finding out I can have blue tortilla chips and low carb tortillas! Holy cow! I was nearly in tears trying to get the plan figured out, then I found your page! Exactly what I need! Can’t wait til tomorrow morning to get started; if I start now, I know I’ll never get to sleep. Hello Gwen, I haven’t read the book yet, but we have Gluten Free in our household, wondering if THM touches on this? Gluten free would be SO easy with THM. A majority of the foods/recipes will work with GF, but unlike most GF blends and foods, the THM recipes are very low in starches. There is an amazing THM allergen free group on Facebook too that is wonderful for families dealing with allergies. Hi, my name is Susan and I’m currently reading THM. I truly hope this will be the eating plan that will change my life. I’m wondering where I can go to download or purchase a comprehensive carbohydrate count food list. I am very interested in THM. I want to order the book and follow your blog too. However I have three girls and two of them are allergic to dairy. Before I plunk down 35 dollars for this book I want to know if I can easily adapt it to dairy free? TIA! I just spotted the THM stuff in the last week and thought it would go along with my “mostly” healthy eating. I try to (on a tight budget) feed the family healthy, leaning towards paleo, but with all things in moderation and not giving up chocolate and coffee! My oldest is vegetarian, my husband loves meat and is allergic to seafood, my youngest is allergic to tree nuts, and my middle child, a 14 year old boy, says he would try the THM way with me in order to slim back down some and feel healthier before he starts the ROTC program in high school next year. Does it seem like this would be realistic for my family with all the special eating needs? And where is the best price to get some of the different things I don’t normally buy that the plan calls for? Thank you, thank you, thank you for your Quick Start Guide! I’m in my 5th week of THM and you got me going in a great direction before I received my book. I still come here to get your awesome recipes, as well. <3 Thanks again!! There are some WONDERFUL support groups on Facebook for THM, including a group for ladies with more to lose. ♥ They are fantastic, and very supportive and helpful! Just wondering if this should be updated to say 20-45 grams of carbs for an E meal? On the FB page its usually emphasized that a “solid” E meal should have at least 20 carbs….? Yes! An E meal should have at least 20 grams of carbs. This is long overdue for an update. Thank you, Emily! I am so thankful a FB friend told me about your website. Just got my THM book this week and my head is spinning! Your quick start plan is a blessing! Hoping I can “pay it forward” someday!! Thanx again!! Many of the ladies using THM have additional health challenges, and experience a variety of great results including weight loss, more stable blood sugars, and more. There are always circumstances that provide extra health interventions too, though. But THM is a fantastic place to start with your diet, and just tailor and tweak to what your body needs for healing. In the process of reading the book. Wanting to get started but feeling overwhelmed. Never been much of a calorie counter so not using numbers is a benefit I am looking forward to. We are on a very tight grocery budget. My husband is a VERY picky eater, not willing to try new things. How can I do this plan and stay on budget and not cook 2 or 3 separate meals. I am not very creative when it comes to cooking. The bread recipe does not contain any oil or sugar. The yeast digests the carbs in the flour…it’s SUCH a fun and unique recipe. Hope you enjoy it! Is the only source for glucomannan through Trimhealthymama.com? I bought mine through Amazon.com. The Trim Healthy tab on my menu bar has a store that can link you to all of the THM ingredients that Amazon carries. I used the NOW brand. Where can I find the “little chart” to keep track of measurement progress that is mentioned in the Quick Start Guide? Hi! Thank you for the quick start guide!! It has been a help to me and a ton of other people! I’m not able to find some of the files you suggest downloading ~ can you update the list on the Quick Start ~ or is there somewhere else other than the FB files to find them? Thank you, thank you, thank you!!! I’ve been trying to get going on the plan for about a month now. I do well here and there but trying to get a good, solid start has me overwhelmed. This is exactly what I needed and was trying to get my head around. I really appreciate all the effort and time you put into making this guide! You’re awesome! WONDERFUL!!!!!! THANK YOU SOOOOOOOO MUCH! Hello! I am trying to get your THM Quick Start Guide to come up. It could be my computer but I am getting “no data” message. That Quick Start Guide is wonderful! I would like to send my interested friends to your page. I wanted to make sure it will come up for them. Could you check? Thanks. I have loved all of the THM things I have gleaned from you and your website, thank you for all your time and energy! I have been on THM for a year now and have lost over 40 lbs. Do you have any dining out guides ? Thank you so much for this blog. I really want to try this I’m super scared though it sounds a little complicated but you are a blessing. i am trying to get this diet together with some kind of daily meals for fat and carbs. to know how to separate and rotate the meals correctly. I have a menu if you’ll check the search bar…that will give you an idea of how I do it. 🙂 The goal is to use the meals that your body craves. Chapter 11 will give you more insight. Basically, you get started and watch your bodies own reaction to the different fuel type meals, and guage by that what you want for each meal. I like to have at LEAST one E meal per day. And pregnant/nursing, or ladies who work out a lot will need more carbs than that. I was wondering, is two deviled eggs made with greek yogurt and bacon bits considered an S meal? Sure, Pam! But I’d include some greens or a nice fluff side salad with it. Greens and veggies are super important! Just getting started.. Heard about your site/blog, etc!! THANKS!! Can someone please explain how this works I’m supwr confused. Do j just buy the book and follow recipes etc. To lose weight? I reviewed the book, so that may help you get your head around it a bit more. I’m working on getting the quick start guide overhauled, so that should be up soon! There are also some awesome Facebook groups that are a big help for getting started. Reading the book is where I’d start though. 🙂 It’s a concept with how you put meals together, so you can use recipes from anywhere as long as they fit the meal category. Thank you so much for the Quick Start Guide. I have been going through the book and it is a bit overwhelming but I really want to do this. My goal is 75 lbs but I know that 50 lbs is probably more reasonable. I would appreciate your prayers as I know this weight loss will enable me to serve The Lord with more energy and longer. I’m 51 and my husband and I hope to retire at 55 and serve as missionaries. I wanted to join the Facebook group but had a little trouble. Once I click on your link and the page comes up how do I join? I prayed for you, and am excited to hear back how it’s going once you get rolling! How can I download your TMH Quick Start Guide? Each time I click on your link, it asks me to log into WordPress. Do I need to have a WordPress Account? I keep seeing fantastic posts of people’s success with THM. I am very interested in possibly trying it myself, but I have a question to ask, that will help me to decide if this plan will work for me or not. I do not eat gluten, dairy, beef or pork. I eat sugar & soy very very sparingly. Considering my food restrictions (allergies), and based on your experience with the THM program, do you think this is something that I could do? Yep! There is a whole bustling, active community of Allergen Free THM ladies over on Facebook. They are amazing. Thanks for this resource, Gwen! How much/what size glucomannan powder and stevia extract do you recommned getting to start off? Once you know what you like, and what works for you, you can scale up to the bulk sizes if you want to. I need to loss pounds and lots of them. Hi, I cannot figure out how to print the docs/files from the Face Book group for the quick start guide. My best guess is to copy/paste them. Facebook doesn’t really have the docs set up to print. I would like to follow your quick start guide and print the documents on the Facebook page. Which FB page? There is the page for the authors, the product Facebook page and numerous THM Groups. Hi Susan, the main THM closed group is FULL of documents now, but you should find plenty of resources there. I’m no longer in the groups, but if you ask they may have a doc that lists them all. Congrats on starting on the plan! You’ll want to make sure you’ve read through the book and understand the principles. While you do want to use whole grains, you want to steer clear of wheat unless it’s been sprouted or fermented to slow the insulin response. Thanks just wasn’t crazy about the texture of the coconut flour. Could you give a better photo of your tabbed THM book with the tab names? Just afraid I am missing something. Thanks for this quick start guide! Great idea, Marty! I could share my views and experience on it. 🙂 I can’t represent their product or brand, but I could share my take on it. I’ll add that to my blogging calendar! thank you SO MUCH for this and the other information you have provided! I purchased the book but so overwhelmed with all the info in it but your Quick Start Guide really explains it in a manner that my little Pea brain can understand!!! Hello Gwen! I’m doing THM for my health’s sake, and hopefully to lose a little weight too. I will be heading off to college this August, and I am not sure how to do THM in the microwave and mini-fridge I am allowed in my dorm. Any tips? Thanks! Hi Meredith! Oh that’s limiting! I’d want a blender, toaster oven, and maybe a plug in griddle to do eggs and such. You can do a lot in a microwave. What about the muffin in a mug…you could multiply the dry ingredients for your favorite recipe and then portion it out into baggies for a quick on the run breakfast. I’m not a microwave pro, but I’m betting you could do eggs and many other breakfast items in there too. Protein milkshakes are a GREAT breakfast! For lunches, I’d do low carb roll ups, salads, and keep fruits and Greek yogurt on hand. The post On the Run Snack Bag has some great ideas for eating on the fly. Thank you so very much for such an amazing resource for the THM plan. The quick start guide has been so very helpful in simplifying the program. I will be singing your praises from the rooftops! May your blessing cup runneth over forever and ever! Hello! I am using your THM Quick Start Guide to begin and looking forward to my book coming in. In your guide there is a picture of what looks like a breakfast on page 15. Can I find that recipe on your website anywhere? I have looked with no luck so far! Thank you so much for all the great info! I am new to the program and feeling just a tad overwhelmed. I think following you is just the ticket. If I used cinnamon sticks in the all day sipper, slimming, instead of cinnamon powder, would that make it less effective. Thank you so much for this Quick Start. Even after reading the book it was hard to understand. I found your site and an so glad that I did. The Quick Start has really helped me out. I am new to THM and came across a delicious Chicken Parmesan recipe on pinterest stating it was a THM – “S” meal because there was cheese (fat). They said to serve over dreamfield noodles. Wouldn’t this make it a a crossover because of the fat and carb combo? I apologize of this is not the place to ask these questions. Thank you for your time and sharing your quick start guide. The THM Facebook group is a fantastic place to get quick answers on things like this. 🙂 The Dreamfields pasta digests more like a protein for most people. So it’s a fun occasional splurge that can be used in S territory without counting the carbs. Hi Gwen! I really appreciate all the work you have put into helping others get started with this plan. Can you direct me somewhere to find more information on doing THM as a lacto/ovo vegetarian? I’m not comfortable with gelatin or collagen, and I am having trouble figuring out how this will work for me. Thanks again for all the time you spend helping others. I can’t tell you what a blessing I anticipate your website to be!!! I just got the THM Plan and Cookbooks. I spent a RARE morning with NOONE else home watching Serene and Pearl videos and getting familiar with the program only to feel overwhelmed. I googled THM to see if there was any other information out there and your site popped up. It was like a breath of fresh air to see all the simplified steps to get started….I am just beginning this journey but I can tell that you and your site will be referenced to often. I know how much time this site took to get to this point and to maintain…..I can’t thank you enough for helping us newbies!!!!!! I hope find lots to love and inspire here! Welcome! Hi Gwen! I am teen girl, and I am following Trim healthy Mama and have lost around 6 pounds so far in the first month and a half. 🙂 But I have been craving orange juice lately, and I was wondering it is allowed on THM? It has no fat in it, and has Natural sugars, so I don’t think it would be a NO-No. But jsut wanted to get other people’s opinions first. 🙂 Hope you can help! Hi Anna! Orange juice is a natural sugar, but liquid sugars are the quickest way to get a sugar spike and rev up the fat storing insulin. So with THM, you’d want to choose slower carb sources, like an actual orange…which also has natural sugars, but it contains all of the lovely fiber to slow down that sugar spike. Try adding in an E meal at least once a day, and more if you’re working out. 🙂 E’s are great brain food and fast energy, and they’ll zap those pesky carb cravings. HTH! I bought the book read a lot of it …too much information…. (totally confused) printed out your Quick Start Guide, even bought a note book, punch 3 holes in it & read, most of it. I must be too old, because I still don’t get it….I’m 66 years old & have to have hip replacement surgery & have to lose weight before then. There is no Weight Watchers, Jenny Craig or ??? with-in 1 hours drive. I just don’t get it. Can you help? I feel like a foolish old lady. I have to go to church right now…potluck social…Help….Thanks! Let me link you to the new Quick Start Guide (here). I recommend that you grab a highlighter and skip to the Appendix Study Guide. It will walk you through what to do. You’re going to define the 2 main types of meals (S and E) and fill in the blanks from the book. Then you’ll highlight the foods that fuel each type of meal. You’re also avoiding sugar, pasta, and off plan breads, sodas, juices, etc. So a church potluck may not be the easiest place to implement the plan starting out. I recommend starting with a simple meal plan at home while you work on figuring out the meal types. Here is a wonderful EASY menu of THM meals and foods that you can find at the grocery store, and how to apply the plan your first week. The hardest part is wrapping your head around it at first, but if you will follow the study guide and tips, you should have it down pat within a few weeks. jo ann im 72 and just starting with this thm too..ive been doing the E plan first cuz it seemed easier and i need and love my carbs lol…im doing this for a few days now and already down 2.5 lbs..i know some of that is water thats fine as long as its off me!! im trying to learn my way around the S plan now..my biggest problem is the protein as im pretty much a vegetarian..u can do it! I am sorry but this diet is complicated and a ton of work. Particularly for a female small business owner where time just isn’t available. I found it way more complicated than Atkins and that diet worked for me. Perhaps because after all the confusion they published a book called Atkins made easy. Lo and behold it was. I just got bored with it. Some of the things on this diet are not available in Canada,ie naughty noodles. Also we can all do without the religious references just get to the point. I’m sorry for me this was a super disappointment and absolute waste of money for the book and then the cook book. Healthy fats are fats found in nature: butter, coconut oil, olive oil, fats found in fatty fish/eggs/or meats (grassfed beef preferred), peanut butter & nuts, avocado, etc. Non-healthy fats are basically anything found in junk foods and on the oil aisle: all vegetable fats and crisco are unhealthy, anything hydrogenated, canola, etc. Just printed my Quick Start Guide, have my plan book and cookbook! I have to say that this guide is AMAZING!! It’s going to help me SO MUCH! Thank you!! Your post are very helpful to me and others. I only offer free online printables of this. Looks far too complicated for me – I’ll have my wife take a quick look in a week or so. One of my male friends has used it with success but my understanding is that his daughter primarily and wife spent hours and hours and hours digesting all of this for him. I just need something simple that says eat this much protein either in calories or weight, and the same for carbs and bread. I’m an old farm boy who became a PhD so I am accustomed to eating simple, e.g. if you told me to eat only six apples a day and nothing else that would be no problem. You told me to eat only fresh steamed zucchini three times a day I can do that. I don’t need recipes I don’t need to taste good I just needed to work. PS I am type II diabetes, 76, healthy and energetic. Need to lose 20 or 30 pounds for diabetes otherwise I’m okay with my weight. I am 6 feet and minute morning weight is 216 pounds. It can be very very, very simple. Center meals and snacks around protein, and use either whole foods carbs (beans, fruits, whole grains) or fats with meals, but not both in the same meal. Foods that have just trace amounts of fats or carbs, you can have as much as you want. How do I actually get a book with actual meal plans so I can see a picture or list of what foods can eat at each meal? It’s. Confusing. Love your posts! So encouraging! I began THM in April 2016…but I’m starting over tomorrow. I need a better understanding of THM. I’m a visual learner…so your guide will be so helpful! Gwen, you are just as popular as the authors. Thank you for your page/blog/posts/encouragement. I have followed THM for almost 2 years and I have fallen from their ways. Up about 30lbs. Halloween night with too much sugar in my system making me bogged down and tears in my eyes… I’m ready for a new start. I got this and so does every person that picks up the book. It’s a way of life. It’s more than a diet. Thank you for the support network. Thank you, Lisa! I’m just getting myself back on track again as well. (((hugs))) I understand. Found a contradiction in Thm Plan book and original book concerning the fuel pull cycle. I’ve done a week already with original cycle of 3 days of deep S,then 2 days of fuel pull,ending with 2 days of refueling with E. Should I do that again the second week or do what the pkan says(2deep S,2 Es,2 FP,then end with 1 E? Need advice. Not sure which cycle to follow. Thanks. Can you mix say ham stake with butter and cheese? Yes…all fats. 🙂 But you really ideally want lots of good veggies in there too! Just starting out…..my friend Bonnie is so excited…..I just hope it works….I have many post menopausal pounds to shed. Wish me luck, here I go! Can I purchase your quick start guide. I don’t have enough space on my iPad to download. Gwen, Thank you so much for this site. I purchased the Plan Book and the Cookbook. Started to read the book, but am a slow reader and started searching for a cheat sheet and you popped up. I printed it and started reading and will continue to read the book, but I am more of a visual person and this will help immensely. I will be 72 in a few weeks. I am overweight to begin with but in the last 3 years my daughter passed away, I moved 1000 miles away and it has just been too overwhelming for me. So, that being said, I am going to put one foot in front of the other and see where God leads me. Can you tell me what happened to the Trim Healthy Mama Official Facebook group? Has it been removed? Thank you! Thank you so much!!!! I am reading the THM book and bought the cookbook but already felt overwhelmed and don’t want to give up before I even begin. Thank you so very much for sharing what you have learned!!! !